I would normally include more than three products in a monthly favourites post. But these beauty bits from Armani, YSL and Kiko Milano have been rocking my socks SO MUCH throughout October that I thought feck it, they deserve their time in the spotlight! I’ve spent many years staying away from orangey reds because my teeth aren’t whiter than white. But this gorgeous YSL lipstick, Rouge Pur Couture Matte in the shade Orange Imagine, changed all that. It’s such a great shade against my colouring that I wanted to wear it ALL THE TIME, and teeth be damned. Then along came a wee session at The White House clinic – which I’ll tell you all about shortly – and now there’s no holding me back. Aside from the shade, there is so much to love about this lipstick. It may be matte but it’s a modern matte, which means the formula feels comfortable and creamy but you’re still getting a fully opaque pigment punch. The gold case is also to die for. You can read my full review here. 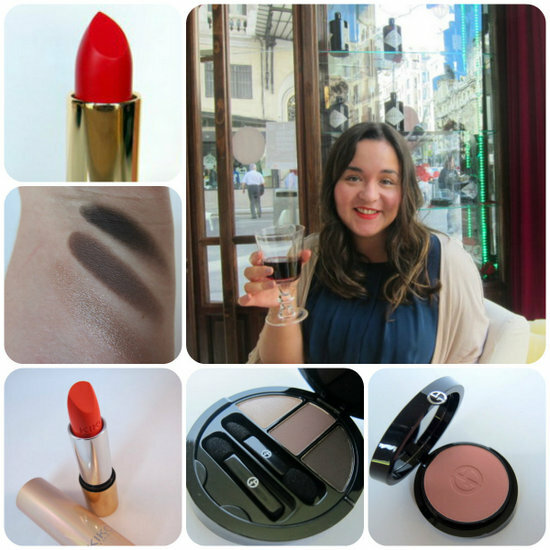 This love affair is what prompted me to choose a vivid tangerine shade from the hundreds of lipsticks on offer at the Kiko Milano store in Alicante recently. (You can read about my trip and the beauty bits I bought over on beaut.ie here). Another modern matte, this one also feels comfortable and velvety if not quite as moisturising as the YSL. But then, it was about a tenth of the price, so let’s not give it a hard time. My other New Favourite Thing is so stunning and versatile and gorgeous to use that I have to force myself to give my other products a chance every now and again. It’s the Neo Brown palette from the Armani Easy Chic collection for Autumn, and it’s divine. Pricey at €65 – this was a press sample – but you’ll get so much wear from it and it’s such exceptional quality that it’s well worth the splurge. The black lacquered palette houses a natural toned rosy blush in the top tier - so flattering on the skin. And on the bottom? Three soft, creamy and pigmented eyeshadows in shades of taupe and brown. I’m just wearing a touch of the lightest eyeshadow in that photo above - perfect with an orange/red lip! That’s what I’ve been loving – so what about you? Check out my previous favourites here! The lip shade looks perfect on you Emma! Great lipstick, definitely something I'd wear myself. Oh yes, I'm a freak when it comes to vivid orangy lips. But they really don't match my skintone, so dark red is my solution :-D Love your posts so much! The Neo color is gorgeous and I'm a huge YSL fan! Great pics. We all secretly love being enabled, admit it! I adore that YSL lipstick on you Emma, I have the Rouge Volupté lippies on my wishlist and I might just have to splash out and get one very soon. Sometimes you find a shade you can't live without, I don't blame you for loving this one. I totally love the colour of the lipstick!! The color for the lipstick is amazing!